From a very young age, parents often attempt to instil in their children the seeds of a future ambition. 'When you grow up- Do you want to become a doctor? Do you want to be a lawyer? or, Do you want to be an astronaut?' The Church similarly also wishes to plant within every child, at his or her baptism, the seed of a very different kind of ambition. It is not an ambition to be rich and famous. Rather, it is the ambition to be a saint. Do you want to be a saint? By giving each of us the name of a saint, the Church is reminding us of our true ambition, our most important ambition is to emulate the heroic example of this particular saint and become a saint in our own right. Our vocation is to be holy. “Salvation belongs to our God.” The first thing we celebrate today is God’s free gift of salvation. Holiness and Heaven are always and exclusively a gift of God beyond anything we can merit. We cannot make ourselves holy. Our sanctification is primarily the work of God. Men and women do not by sheer determination and self-discipline become saints. Sanctity is a divine gift. It is indeed the power of the resurrection at work in human lives. Thus commemorating the saints is nothing other than a way of affirming that the victorious power of Christ is at work, all about us, in human lives. 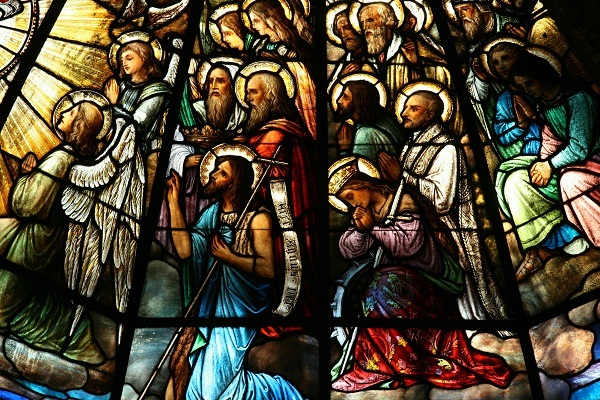 In honouring the saints, we proclaim the victory of the grace of Christ. God is so powerful! It is He who can transform a sinner into a saint. It is for this reason that we come to understand that holiness does not consist of 'never having sinned'. The best way to think about holiness is as the attitude that, from which being generous and faithful to grace, returns to God the love that He had deposited in our souls. Because of this, if we want to be saints, it is more by God’s providence than by our own initiative. We don’t look for holiness in order to be ambitious, but God wants us to be saints and because we praise Him when we strive to attain holiness. Holiness consists of letting Christ redeem us even when we have sinned badly. We can’t make ourselves holy. All that we can do is to open ourselves up to Christ to let Him scrub us clean, to let Him make us bright and shining! But as much as Heaven and holiness are God’s gift that we cannot earn, God out of love has made them the result of our choice, the result of our acting on that longing. To get to heaven, as St. Thomas Aquinas said, 'we need to will it, we need to desire it, we need to choose it'. Life is ultimately a choice between true, lasting happiness and momentary pleasure; a choice between light and darkness; a choice between good and evil; a choice ultimately, between life and death. Jesus came down, not only to show us the way to choose well, but also to help us to choose well, but there are competing voices that attempt to seduce us to choose against what God wants. The saints are those who have chosen well. They are the multitude of men and women, just like us, who have responded to God’s grace and chosen Him, though He had already chosen them. Each saint is a unique image of Christ in the world. This is why we have images of saints — because they are images of Christ. We see Christ alive in them. Saints are ordinary Christians who have been completely fulfilled in Christ. Therefore, every Christian is called to be an image or likeness of Jesus in the world. Pope Benedict said saints are “living theology” and that we can only interpret the Scriptures through the lives of the saints. 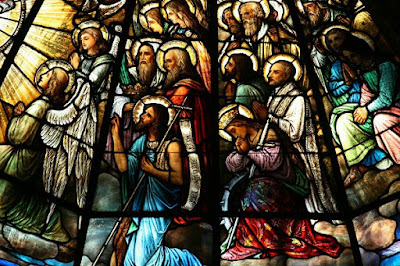 In the saints, we see the theories of our faith lived out in human history. In the saints, we see the truths of Scripture alive in the lives of ordinary people. In the saints, we see the grace of God at work in a powerful and real way. In the saints, we come to recognise that what is humanly impossible to man is made infinitely possible by God. We venerate the saints because they show us the face of Christ. We venerate the saints because they show us our destiny. On this Great Feast of All Saints, let us heed the call of Pope St John Paul II, who proclaimed more saints in his pontificate than any other pope in history. As he spoke to the young people gathered at the World Youth Day of the Great Jubilee, “Do not be afraid to be saints of the new millennium! Be contemplative, love prayer; be coherent with your faith and generous in the service of your brothers and sisters, be active members of the Church and builders of peace. To succeed in this demanding project of life, continue to listen to His Word, draw strength from the Sacraments, especially the Eucharist and Penance. The Lord wants you to be intrepid apostles of His Gospel and builders of a new humanity.” Dare to be a Saint! All you holy men and women, pray for us. Amen.